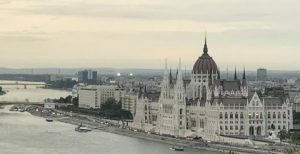 A visit to Budapest this year provided a small glimpse of the horrifying and repressive times Magda Szabo, the much-lauded Hungarian novelist, lived through. For eight years she was cast into the writing wilderness for being deemed anti-communist. Later the regime recognised and accepted her, as did readers around the world. 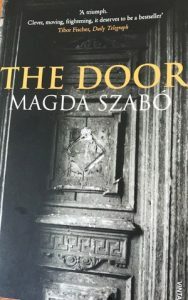 In Szabo’s novel, The Door, the characters are extraordinarily distinct. They draw you into their lives with directness, introspection and mystery until you can’t put the book down, particularly as the narrator is considered to be the thinly-veiled author herself. In 2005, almost twenty years after it was first published, The Door was for the second time translated into English. Ten years later, after republication, the New York Times named it as one of the best books of 2015. The Door is set in a neighbourhood street of Pest on the eastern bank of the Danube, as are the Museum of Terror and the House of Parliament. The driver taking us from Budapest Station to our hotel stressed we should go to the Museum of Terror. The name put us off, but we went. 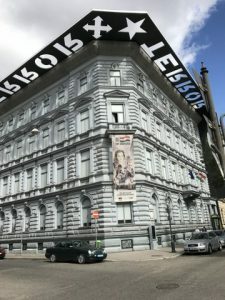 The imposing and unsettling building on Andrassy Avenue was the site of despicable acts by both extreme Fascists (the Hungarian National Socialists known as the Arrow Cross) pre and during WW2, and the Communist Party post-war. Visitors come away shocked at man’s brutality to man, yet lauding a society that confronts its past, presenting faces and names of victims on external and internal walls for all to see. 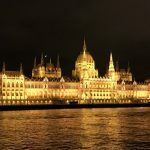 The red communist star no longer sits on top of Hungary’s House of Parliament breasting the Danube’s Pest bank. Outwardly the magnificent building bears a deliberate resemblance to the UK’s Houses of Parliament, but inside it makes you gasp. The use of gold leaf is liberal – including on skirting boards. Photography is permitted except beneath the dome where two sabre-carrying guards stand beside the royal crown and jewels of the former monarchy. 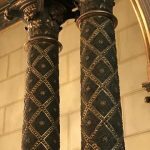 The craftsmanship on pillars, ceilings and doors is exquisite and acknowledged in the basement museum. 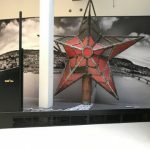 And that is where the communist star is now on display, lest anyone should forget the terrible times Hungarians suffered in the past. I have not heard of Magda Szabo so thanks for sharing. I will put ‘The Door’ on my list of to be read books. Fascinating insight, Diana and so beautifully written. Great post and I will seek out The Door as I have not read it. So wished we had taken the time to go inside that magnificent Parliament building. It’s always good to have a reason to go back somewhere…enjoy the tour inside when you do, Cheryl.